Until 1875, Fort Nottingham was described in the deeds office as Nottingham after the Sherwood Foresters’ hometown, but its name was changed to Fort Nottingham to avoid confusion with the village of what is today Nottingham Road, which grew up around the railway line. The line reached the site of the future Nottingham Road station by the end of 1883, and the station was constructed where the line and road to Fort Nottingham intersected. 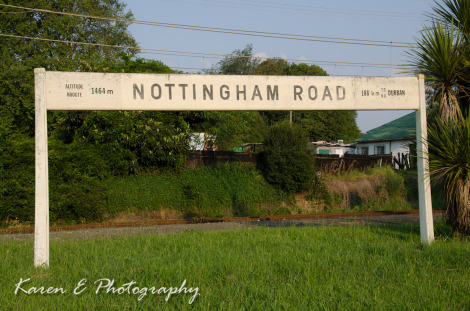 Before the station opened it was called Harrison’s Camp after the railway contractor, but then became known as Karkloof Station until late 1887, when its name was changed to Nottingham Road Station as the locals complained that it was too far from Karkloof to be so called. The railway transformed the area, with farmers being able to get goods to and from Pietermaritzburg with ease as well as having a daily postal service. The Nottingham Road Farmers Association was formed in October 1887, in what was known as The Railway Hotel, where the present Notties Hotel is today. The hotel soon became the centre of social activity for the area, which became increasingly popular as a holiday destination, with its fresh, cool air and lovely countryside.